Realistic Reborn baby dolls are those baby dolls that look real. You know, the ones that are really quite beyond regular baby dolls and so realistic that they look like a real baby. Some of them are so life like that they became known as Reborn dolls. There are even classes on how to transform regular baby dolls into these Reborn baby dolls. 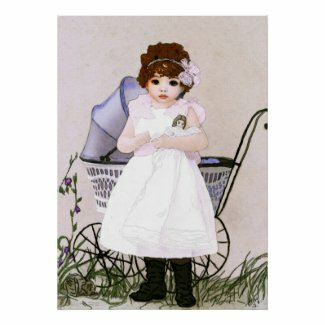 And there are quite a few doll artists and doll companies who specialize in this type of life like baby dolls. Here I’m presenting several different types of these dolls so you can choose your favorite one for yourself if you’re the doll collector, or for an older child or friend who loves these replicas of babies known as Reborn baby dolls. In a hurry? Click here for Realistic Reborn Baby Dolls! I have several friends who collect these dolls and I love holding their little “babies” for a while. I think they would be a great gift for an older girl who still loves dolls as they are so much more realistic than the usual childhood dolls. First up are the miniature realistic baby dolls. These tiny Reborn baby dolls look like little preemies, only being around 10 inches average. They are weighted to feel more like a real little baby, but they are definitely miniature. But a lot of doll collectors don’t really ever handle their dolls, instead locking them away in boxes or glass cabinets. These little dolls are perfect for them because they look exquisite and real, but are so delicate they are suited to display more than handling. You can get different styles of these Reborn dolls, as in newborn, or infant, and boy or girl. You can also find different skins and hair and eye combinations. If you don’t see the one you want, Click here to see more Miniature Reborn Baby Dolls! Little boy Blue is what I think of when I see this miniature doll. Darling in every detail, including the knitted outfit. Adorable girl doll would be perfect to own and display next to the boy doll. Same exquisite detail and cute little pink knitted outfit. These dolls are tiny ones, sort of like a preemie baby. Each is adorable in its own way, it really depends on your own taste. Boy or girl? Reborn baby dolls are real life size, typically from 14-19 inches which is still a little small for a real baby, but they are weighted and feel real. You will feel like you have a real baby with these lifelike baby dolls, any of them. They have different personalities so you might want to choose the look of your Reborn baby carefully. They are so realistic you might forget they are dolls and start thinking of them as babies. When I was young and playing with dolls, I always wanted a boy doll. It seems there are so many girl dolls and not so many boy dolls. This little guy is adorable and with his green outfit reminds me of an elf. These dolls are real bargains in the collectible world. So if you need to keep costs down (and who doesn’t these days?) one of these adorable dolls will make you or whoever it’s for very happy! Each one of these Realistic and Reborn baby dolls looks just like a real baby. You will be shocked at their lifelike quality. They are weighted too, so that it’s just like picking up a baby. There are many choices from several famous doll designers and doll companies. I have presented an assortment of these baby dolls that are so realistic you will not believe they are dolls. They are that real looking! Reborn baby dolls are not exactly the cheapest dolls to collect, but all of the ones here are less than $200. They say that these lifelike baby dolls are actually used in therapy in some nursing homes and they give great comfort to some of the seniors there. They are about 20 inches long like a real baby would be, and everything about them feels real. These are fine collectibles, not meant to be used as toys. I am very interested in classic toys in general, and classic dolls as a subset of them. I like the old standby toys, the ones that have always been popular with children. But when it comes to dolls, there is a huge worldwide fan base of collectors which I find fascinating. When I lived in Las Vegas, which is a leading convention city, I happened to be on the strip during a realistic doll convention and saw the rabid fans in action. Those ladies would dress up like Mary Poppins and put their babies in strollers and prams and walk around like the dolls were real babies. The doll clothes and the contests for the best ones approached fashion shows in New York City. And the doll designers themselves are treated like Rock stars at that convention. It’s just a fascinating slice of life that I noticed and it made me come home and research those dolls. So I decided to do a page about these fascinating little works of art, which is what they really are in some cases: little sculptures. There are also other doll conventions, ones that emphasize different subsets, like Barbie dolls, and Monster High Dolls for example. And then there are conventions that encompass all the collectible doll lines and series and companies. Manufacturers come from all over the world, and buyers from retail outlets too. Marie Osmond has her own line of dolls for a long time now, and many of hers are baby dolls. I really like hers as she seems to take pride in hers and the attention to detail is incredible. Many singers in many genres have dolls named after them and collectors snap them up as fast as their fans. Several of my friends are avid collectors of dolls, one has Barbie dolls going back at least 30 years because she worked at Mattel and was able to buy them at a huge discount. One collects every doll Marie Osmond comes out with. The way they talk about their collections is just as obsessive as pet owners sometimes are. I have a few dolls myself, a Shirley Temple doll in her box with lots of clothes, and a few Madame Alexander ones too. But nothing like my friends who go bonkers over the newest and best doll from their favorite collectible doll company. I just find the whole thing fascinating. Still searching? Click here for Realistic Reborn Baby Dolls!